Silversmithing for beginners requires a basic understanding of how to measure, mark, cut, file, solder and finish a piece of jewelry. A basic ring made out of flat silver is an excellent project for individuals learning the silversmithing process. Cutting the silver in a straight even line is one of the most difficult processes for beginners to master. Making a basic ring provides the opportunity to learn the basic skills needed to advance into more difficult silversmithing projects. Silver can be purchased in sheets, wire and ingots. The sheets are available from 8 gauge to 30 gauge. Smaller gauge numbers indicate thicker silver. The best gauge of silver sheeting for beginning silversmiths to use is 20 gauge. Silver wire can be purchased in round, square, half round and stamped varieties. 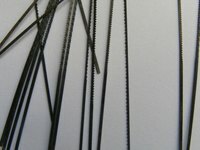 Different gauges and widths are available from 10 to 40 gauge. Again, the smaller the number, the thicker the silver. Widths are purchased in millimeters. Silver ingots can be purchased up to 99.9% pure silver. Silver ingots are used in the casting process. Basic tools required for a beginning silversmith include a jeweler's saw, saw blades, jewelry files, jeweler's pliers, sandpaper, metric ruler, solder (soft, medium and hard), acetylene torch, torch tips (sizes 0, 00 and 1), striker, glass bowl, pickle (crystals used to create a bath to remove oxidation after soldering), ring mandrel, small vise, bench brush, dust pan, bench pin, rawhide mallet, scissors, metal tongs, soft cloth, ring chart, paper, jeweler's clamp, flux, fire and a heat-proof soldering surface -- such as a fire brick, a well-ventilated work area and rubber cement. A set of ring sizers is nice but not necessary. Silver solder is available in three weights: soft, medium and hard. The different weights signify the temperature required to melt the solder. Soft silver solder has the lowest melting point. Medium is next, with hard having the highest melting point. The different weights of silver solder allow several layers of silver to be soldered together in one project. Beginning silversmiths should start with only one seam to solder so that any weight solder can be used. The hard solder will be used first, then the medium, and finally the soft when making a silver item that requires a maximum of three solders. Saw blades are sold in sizes 8/0, 6/0, 4/0, 2/0, 0, 1, 3, 5, 7. The 8/0 is the smallest with size 7 being the largest. A good saw blade for beginner silversmiths is the 0 blade, however, larger blades will result in more lost silver during the cutting process. The saw blade is placed in the jeweler's saw with the teeth facing down. This allows for easy cutting of the metal. The saw blade does not have to be thrown away if it breaks as long as the piece is still long enough to fit between the ends of the jeweler's saw. The ends of the saw adjust. Beginners will find that the saw blades break very easily. It is important to cut on the vertical when using a jeweler's saw. The saw blade works with the down motion and does not grab the metal when repositioning the blade. The saw blade should always be positioned at a right angle to the piece of metal and never forced or twisted. The length of the metal required for making a ring is determined by looking at a ring sizing chart. A paper ring is drawn on paper then glued to the surface of the sterling silver. A jeweler's saw is used to cut out the ring. The paper is removed and the edges are filed so they are smooth and even. The flat silver ring is wrapped around the ring mandrel. A rawhide mallet is used to shape the ring. The ring is clamped into the jeweler's clamp. Flux and solder are placed on the seam. The ring is heated until the solder melts. The completed silver ring is placed in pickle for approximately 10 minutes then removed and rinsed in water. The surface is sanded and polished, then it is ready to wear.